Augusta. A city in Georgia (and some other states). But in the spring, in the South, when people say Augusta they mean: Augusta National, Augusta National Golf Club, the famous golf course. The famous golf course that is home to annual Masters Tournament. The best golf tournament… ever. 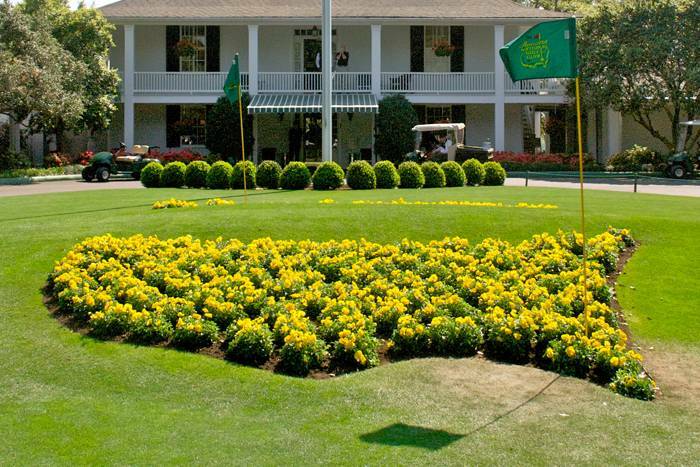 Augusta National Club House- The Masters. In case you don’t keep up on sporting news, the best sporting week of the spring is here: MASTERS WEEK. Which means all of the golf world has descended on the beautiful piece of land: Augusta. I’ve talked about it before, but is is just so amazing. Sadly, Augusta got really slammed by that February storm we had. I know people who live in the area and they were with out power for over 90 hours… that is over four days. If it did that number on the power lines, you can imagine what it did to the trees and grounds. The famous Eisenhower Tree on the 17th hole was so damaged that that they had to cut it down. I haven’t been this year, but the general feedback from those who did go is that while the grounds are as pretty as ever, there are a lot of missing trees and shrubs, so it looks… well, thinned. Oh, mother nature. So yes, I still love The Masters. For the second year in a row I am using the nifty app on my Samsung smartphone to keep up with what is happening. The official Masters app is free and is great. First, the graphics are awesome and it has some great pictures of Augusta as soon as you open it. You can not only keep up with the leader board, but you can select certain players that you want to get updates on. I used this last year to keep up with the leader board and just this past week discovered the way to keep up with certain players. My two faves: Phil Mickelson (which, WOW, how can is be a decade already since he won his first one?) and Fred Couples both got starred! We’ll have to see how it all works out. So, that is what Augusta means when you hear people talk about it… at least in the Spring!